This Eucalyptus variety is attractive for numerous reasons. Commonly known as a Snow Gum tree, it displays beautifully patterned, silvery white bark and large grey-green aromatic leaves that are accompanied by small, white dandelion type flowers in late spring/early summer. As well as its aesthetic features, Pauciflora Debeuzevillei’s low spreading habit and good resistance to cold weather (one of the hardiest of all Eucalyptus) has led it to be awarded with the RHS Award of Garden Merit. At a young age, the foliage exhibits a mid-blue colour before turning grey-green as the leaves mature, becoming thicker, and lance shaped, growing to almost the size of the palm of your hand. The foliage lasts well through the colder months, as Eucalyptus trees continue to grow, very slowly, throughout winter. 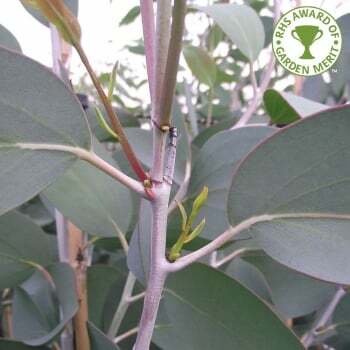 Whilst this is a very hardy variety of Eucalyptus, it does prefer full sun and a moist well-drained soil, although it will grow in most other conditions. Eucalyptus trees grow best when their roots are undisturbed so it’s a good idea to plan the position of your tree carefully. Our pot grown Snow Gum trees can be planted at any time of the year. Start by removing all weeds and grass within a metre of your intended planting hole. Dig a square hole as deep as your root mass and approximately 2x as wide. To help your tree establish more effectively, especially if you have poor soil, we advise sprinkling root grow in the hole. If you’re planting in spring, summer or dry weather, water well and regularly for the first few months. Make sure to keep an eye on young Snow Gum trees and increase watering if there are extended periods of hot or dry weather. If you’re planting in autumn, you may only need to water your tree a little. Snow Gum trees require formative pruning in the first few years. This should be carried out between February and March. The key thing to remember when pruning a eucalyptus tree is to never cut the central leader stem.